Started the day once again in Glendive and most of Northern and North Eastern Montana was under an Enhanced risk for today mainly for hail but a decent 5% Tornado Risk as well. Storms would be very fast moving and some models had the storms crossing into Canada today as well which would be fun to chase if it were to happen. Got to Malta at 3pm and waited on Initiation and as the day went on both the HRRR & Nam4Km agreed on just a few Supercells heading North East from the Great Falls area and following Highway 2. We positioned south to get a good look at the first Supercell of the day which promptly went tornado warned when it was 25 miles to our west, a big problem with this storm was both its motion and speed. Firstly it was moving at 60-70mph and secondly moving through an area of lakes with no roads for 70 miles. This was going to be fun! After letting the rotation go right over us we were slammed with 70mph RFD winds which took Craigs door completely off his vehicle. This delayed us somewhat as we tried to fix his door and untilmately stopped us from getting back in front of the storm which was now racing away at 80mph (An Impossible Task) After getting to Glasgow we dropped south to another Supercell and watched as Lightning flickered away as the day ended. Today's risk would take us back east to North Dakota. A slight Risk of Supercells with a small risk of a Tornado but only if the cap could once again break. My target was Bismarck which was on the triple point and we went there for an early lunch and watched the boundary bubbling away. At about 730pm finally the cap broke but it was slow going and the cap beat down the first couple of storms but the storm below would go on to become 1 of a pair of Supercells that would sit stationery South West of Bismarck for most of the evening. We stayed east of the Missouri River thinking they would move North East but had to watch from the other side for the rest of the evening. We did find an amazing viewpoint South East of Bismarck and watched for a few hours lightning dancing over the Missouri which in itself was amazing, Tim Marshall and the TWIRL crew also joined us in this tranquil setting. After that we went back to the Hotel and were awoken at 430am to an intense Bow Echo rattling across North Dakota which brought 70mph winds and Golfball sized hail. A very early wake up call! Left Wall and had lunch in Sturgis, after this we went to Devils Tower as we knew the Cap would break very late if at all during daylight hours. After picking Glendive as our target which would be near enough developing Supercells we grabbed something to eat and waited. The Cap was very strong unfortunately and it was bang on dusk at around 925pm (MDT) that the first cells fired. There were heading North East so we took a north road towards Richey and in the next 2 hours between 11pm and 2am witnessed 4 seperate Night Time Supercell up near Wolf Point. The first 3 were LP Supercells and the last what I can only describe as a stack of plates with green bands even visible at 1am in the morning!! It was such a shame that these storms initiated so late as if they were in the light the structure would have been something to behold! Pictures still need working on so will put on the Devils Tower ones for now with the rest to follow. We awoke in Colby after a very underwhelming day in Colorado the day before with a view to get up to the Northern Plains ready for some Severe Weather for the 2nd half of Tour 4. In hindsight we probably could have done another day in the Southern Plains with a decent risk in SW Oklahoma and the Texas Panhandle. The Minnesota Risk was just too far out of our reach and we needed to be in Montana so we headed North towards Valentine and SW South Dakota. On the way some Severe Hail Storms went up to our North which were very nice on the eye and further North west a stunning LP Supercell near Rapid City which we just could not make in time. But for a travel day we saw plenty of distant storms and got some nice pictures. And the day was not over there, with a 3/4 full Moon our trip to the Badlands although clear skies was ruined with such a bright moon and also the KP5 Solar Storm had not impacted as much as first thought. 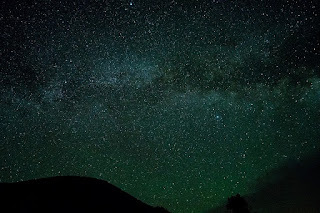 So we waited until the Moon set at 230am and until first sunlight meaning we had a 90 minute window and once the moon went it was a spectacular Milky Way show over the Badlands of South Dakota! Colorado Magic ? The Denver Cyclone ? It all looked too good as we went to bed in Scottsbluff the night before. Surface Cyclone expected to be sat over Denver with south easterly surface winds and low 60's dewpoints I was very excited...................That was until I got up and saw a south eastwards moving MCS Over South west Kansas and the Panhandles. This effectively stopped the flow of moisture north westwards and shunted everything south a few hundred miles. It was now a race against time and a race we would ultimately lose with the first photogenic Tornado of the day down near the Raton Mesa and 10 miles east of Trinidad. This was more a Peublo Cyclone!! We went south from Limon and storms were mush all day never reaching Supercell status and dying off as they left the front range. 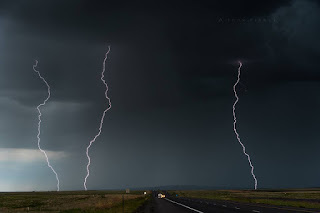 A secondary area of storms fired in the Panhandles later on and another significant Tornado occured at Dusk north of Amarillo and by that time we were almost at Colby for the night getting ready as the system moved east for the next day. A very dissapointing day given what it looked like the day before. I never even took a picture - Ouch bad Colorado! After this tornado struck a few more storms fired up and we were treated to some Supercell structure west of Miles City but overall a very frustrating chase due to a bad mistake in a bread and butter set-up which I should have known better and chased a hundred times before. Onto Colorado tomorrow for another enhanced risk. Last day of Tour 3 started in Limon and our hand was forced today really as we had to be in Dallas for tomorrow morning. The area I liked around the Colorado Springs area was out of bounds due to distances so we headed down Highway 287 towards Lamar and just went with whatever popped up along the way. A few storms started looking interesting west of Boise City so we went west to Clayton and stuck with them for an hour or so. Structure became quite nice for a time but it was the Cg's that were the star of the show on this storm with some bolts coming out of a very tall anvil into clear air. A nice little send off for Tour 3 which at least had some great lightning on this trip but a big no to the Illusive Tornado! Started the day in Raton (NM) and it was a rinse and repeat day with weak upslope flow and no upper support for anything decent. 20knts of flow would favour weak Multi Cell and Pulse Type Storms. After chasing a few storms around Colorado we settled on an active storm near Limon and watched Lightning approaching from the Bennett area. Another poor day in this period of chasing and did not even take 1 picture today. Lets hope the last day of Tour 3 ends on a high note. Started today in Scottsbluff after a down day at the Badlands yesterday. Storms today would fire on weak easterly upslope flow on the Rockies and drift off the mountains. After lunching in Limon we headed down towards Peublo and The Raton Pass and played with some hail. Not much else on offer today with terrible structure and frustrating pulse type storms. This is a very tough pattern we are in at the moment. 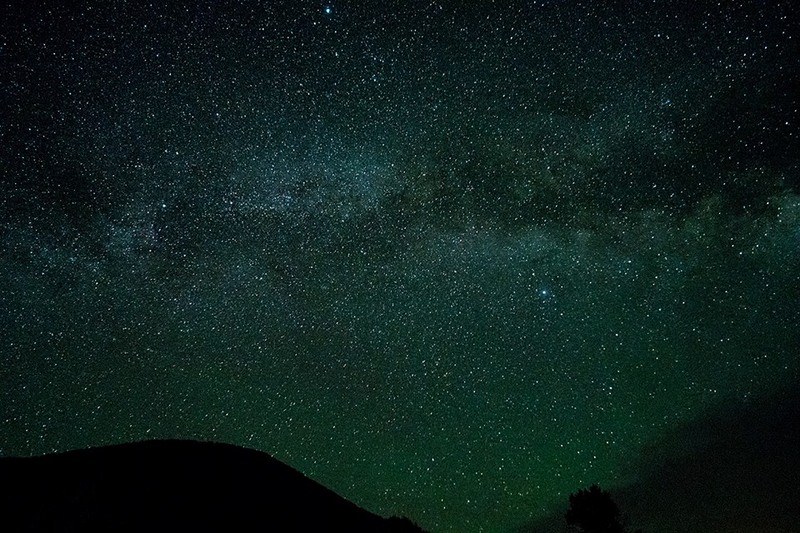 After eating dinner we went to Capulin Volcano and shot the Milky way under the most amazing clear skies I have ever seen. After a leisurely 2 day drive from Big Spring to Sioux City we had a chase in parts of South Dakota and Minnesota today. SPC has a small 2% Tornado risk box over Southern Minnesota and Eastern Minnesota along a warm front. Things had trended downwards overnight and things did not look great for tornadoes on morning model runs. We left and had lunch and then headed north into extreme south-west Minnesota. The warm front further east as expected had been contaminated with overnight clouds and rain. Our main play was storms that had fired earlier in Eastern South Dakota that crossed a weak frontal boundary and moved into mid 60's dewpoints. About this time storms were starting to congeal with each other from contaminated outflows so things were not looking great and all we got really was an outflow dominant shelf cloud. Not great for a 1100 mile drive north only for us to get back to Colorado and New Mexico over the last 4 days of the trip. If only we had a crystal ball eh ? Started the day in Amarillo and SPC went marginal for today with a less than 2% Tornado risk once again. There was nice moisture pooling up against the Caprock today so was very hopeful of some nice structure at least and borderline supercells. An old weak outflow boundary was also in the area from the previous days MCS. We got onto a storm SW of Lubbock near Brownwood and this was really high based and struggling for a good few hours. My attention was then drawn to the radar and the westwards moving OFB was moving along Interstate 20 about the same time a storm erupted down near Lamesa. This storm latched onto the weak boundary and went into a HP Supercell really quickly. The structure was stunning with vivid green skies in the large hail and the Cg's spitting out were really quite dangerous at times. We only noted very weak rotation a few times and the writing was on the wall when huge walls of dust and cold outflow winds undercut the storm and killed it off North of Big Spring. Still a fun chase and great structure for a marginal risk day. A few days travelling upto Minnesota coming up before the next risk on the 3rd June. Started the day in Odessa and drifted north towards the Northern Texas Panhandle on a long shot of something firing and an outside chance of a Tornado. We waited quite a while late into the day as the cap held strong but at about 8pm finally towers exploded west of Dalhart and south of Amarillo. We had a choice to make and opted for the Northern Option and our storm quickly became an LP Supercell spitting out stunning lightning west of Channing. The tornado risk by now was non existant but to see and watch this storm transition from LP to HP near Sunset was a great start to tour 3. Everyone got some amazing Cg Lightning shots and we followed the storm back to Amarillo where we stayed the night and let the Storm roll over the Hotel. The last day of Tour 2 saw us waking up in Kansas near Wichita and we drifted down I35 towards Dallas and the changeover day knowing storms would erupt along a surface boundary near the Oklahoma and Kansas Border. We got onto the first storm of the day which turned briefly Supercellular and dropped 2" Hail near South Haven. Structure was very pretty as it transitioned from Classic to HP very quickly. After that storms got very messy and outflows congealed it into a system of storms so we headed south towards Norman for the night but along the way one last surprise and a stunning little LP Supercell near Guthrie gave us some last camera action before the tour came to a close. Awoke today in Salina with a Moderate Risk on offer and a 15% Hatched Tornado Risk across most of Central Kansas. This was supposed to be the big day and clearly it had all the parameters to be with the main trough ejecting out onto the plains. One big problem I could see was zero capping and storms ongoing from before midday, this was going to be one of those messy days. We headed west to Russell and then south to Great Bend to look at a line of storms moving through Greensburg and some of them had tornado warnings on them as they headed towards us. Visibility was awful and there was no structure to be had at all. Dewpoints were also mixing down at this point and at 3pm I pretty much knew it was game over for any chance of Supercells or Tornadoes today. In fact I never even took a picture as nothing was worthy of it. We headed over to Wichita for the evening and watched the 2nd line of storms from Colorado come across the Hotel and even that was tame and meagre. A pretty shocking day given what was on the table but the preceding 5 days had been great so everyone was still happy. Started today in Pratt (Kansas) and early thoughts were this was going to be a down day due to the SPC Downgrading the Kansas risk to Marginal with a 2% Risk for Tornadoes. We drove North to Great Bend for Lunch and awaited more model updates, it certainly felt like a decent chase day with temps in the 80s and Dewpoints in the High 60's. It just had that feel to it and after driving east to Mcpherson the atmosphere felt like a bomb was going to go off. Once again Outflow Boundaries would be the driver today and there were 2 left over from the previous days storms. One near Wichita and the other just north of I70 near Salina and we were positioned between the two boundaries. A new SPC update came through about this time and the upgrade of a 5% Tornado risk was now put on the SPC Page with it running from Wichita down to Oklahoma City, the Salina risk was in the 2% Marginal Zone. At about 430pm convection was really starting to fire off in both OFB areas, the first near Ellsworth and the second between Wichita and Emporia, both looked decent although i noticed the southern area was fighting quite a strong cap with Pileous showing on a few occasions. I made a decision to head north towards Salina but must admit looked over my right shoulder at least 5 times umming and aarging!! As we got to within 15 miles of the Salina storm the updraught started to explode so the chase was on. We came off I-135 near Minneapolis and watched the storm become stationery, it had hit the Outflow boundary already and was immediately Tornado warned. Our problem at this stage was we had been caught out by the storms stalling and had now been put into the hail core with golfballs falling around us and we even missed the first Tornado SW Of Minneapolis. We then went back south to near Bennington and observed a few shear funnels but the base was still very high. We continued to follow the storm and when it was near Solomon it really got its act together and at 605pm the rotation cranked up and the first large Tornado dropped in front of us. We watched this transition quickly from a cone tornado into a 3/4 mile wide Wedge almost looking exactly like Bennington from 2013! Was this redemption ? I think so and it was now to put that 3 year pain behind me finally. Now it was time to keep up with the east south eastwards moving Tornado which was crawling along the boundary at 15mph. The only road available without coming across the damage path was Interstate 70 eastbound. I am not a fan of chasing along these types of roads but we never once came across any problems with the road being shut by the Kansas Highway Patrol. We next intercepted the Violent wedge just north of Abilene and it had now been on the ground for about 45 minutes. The storms motion was jogging along just to the south of east always staying about 1 mile north of the Interstate but it would cross soon just east of Abilene so we went back eastbound to get a mile or so in front of it and stopped on a hill on the hard shoulder of Interstate 70 to watch it cross the road, the roar was deafening at this point as we let it get to within a 1/4 mile of us. Below : EF4 Wedge Tornado about to cross the road behind us. 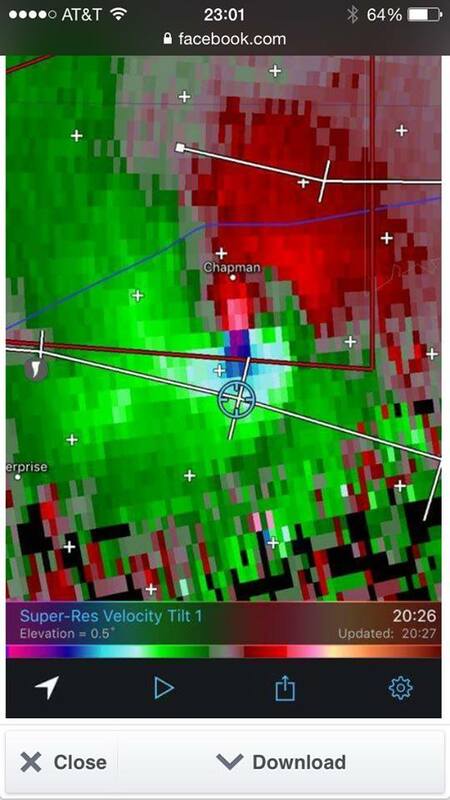 Below : Tornado cross the road having been on the ground for 1 hour now. After this we watched the tornado cross the road and went south through the town of Chapman where a Tornado Emergency was screaming out over the radio. 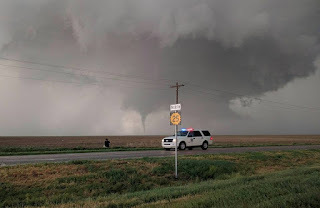 We drove about 1 mile south of town and onto a Hill and wached in horror as the town disappeared with the now rain wrapped wedge tornado roaring into town. We all took a group decision to go back north once the tornado had passed and lend some help or first aid and it was effectively chase over after this point with the tornado still on the ground roaring off to the east having been on the ground for 92 minutes solid. After driving back through the town is dawned on us just how lucky the town was with the damage path just missing the town by about 400 yards and ripping up trees and power lines instead. This unlike Dodge City day was a sobering one for us at the time as we did not know just how many towns had been hit or levelled until later on and only then did we find out just how lucky people were with the Tornado managing to miss and sideswipe about 6 towns in the path and not hitting one of them. Above : Some Radar Grabs showing our Position relative to the storms cycles. Awoke on this day in Childress and SPC went with an Enhanced Risk of Storms with a 10% Tornado Risk centred around the Woodward area with a broad 5% around that stretching up into Kansas and down to the bottom of the Texas Panhandle. An Outflow Boundary would be the major player today and with Mid 60's Dewpoints today looked very good with Strong Instability and 45kts of Flow promoting intense Supercells. After heading north we grabbed lunch in Shattuck and noted the boundary moving back to the north so on we pushed into Kansas. We went further north to sit about 10 miles south of Minneola and watched Towering Cumulus explode before us, this would go on to become the amazing Dodge City Cyclic Supercell. We soon passed through Minneloa with Tornado Sirens blaring and stopped about 3 miles north of town to watch a rapidly rotating wall cloud to our west. From the look of the wall cloud it was only a matter of time before we had a tornado and sure enough the first touchdown occured at 1659pm about 4 miles North West of Minneola. The tornado was now starting to head to the north quite quickly so I repositioned us further north and then west down dirt roads. This was the most exciting part of the chase because we soon came across rain soaked tracks which put the cars and the drivers through their paces. Our first Tornado was now roping out to our North West and a stunning occlusion hand off to the North East was going on. The Supercell was now taking on an ominous look with 2 Mesocyclones and it looked odds on that we would be getting twin tornadoes as we approached from the south just a few miles away from the churning mesocyclones in front of us. Just after the above photo was taken we actually had 3 Tornadoes on the ground at the same time, this was turning into a fantasy chase. The bigger tornado to the left was almost stationery at this point and we finally got back to tarmac and watch a huge Barrel Tornado turn into a tall Stovepipe with a wheat field in front of us just 5 miles South West of Dodge City. This Tornado started to rope out after about 15 minutes on the ground but off to our North was a huge Wall Cloud hanging just to the west of Dodge City, another Occlusion was about to happen and this time swirling multi vortexes were only going to turn into 1 thing a large wedge Tornado! About this time traffic problems to the south of Dodge City made it hard to keep up with the storm for about 15 minutes but we went around the ring road and heading north towards Jetmore where we saw another 2 Tornadoes North of the Town. The last Tornado we intercepted on this storm was the closest just south of Jetmore and this one caught me out a bit as it was on the top end of the storm and crossed the road moving East South East right across the road in front of us slamming the car with wet RFD. After this we headed back south to Dodge City as the Storm had finally crossed the boundary and started to fall apart. We stopped at a garage and took pictures of the incredible Mammatus display going on above our heads at the end of an incredible chase day that gave us the most cyclic Supercell I had ever seen. Started the day with high hopes in the Texas Panhandle and with a 5% Tornado risk we didnt have to go far and headed to Shamrock for lunch. An LP Supercell fired between Shamrock and Childress and we were in a perfect position to watch this from initiation. After staying east of it for an hour it was clear there were capping concerns early on and I was torn between a westward moving outflow boundary near Woodward and another Outflow Boundary near Childress. I chose the Childress option due to numerous storms heading up from the Lubbock area. In hindsight I should have stuck to my gut as a storm did go up near Fort Supply and interacted with the OFB Late on. 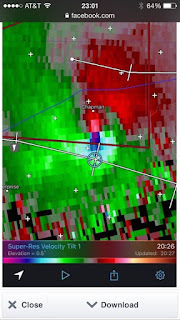 But we stuck with our storms which were appalling for most of the day and when we finally put 20 miles between us late on to get some LP Structure and lightning it went on and hit the OFB near Childress and became stationery and started dropping large tornadoes. But of course sometimes things happen which go against you and this was one of those frustrating chase days, lots of flooding rains the preceding days had caused numerous road closures and our road to the night-time wedge was closed meaning a 45 mile detour which we simply could not make. A very Frustrating chase day in the end when we could have just driven west to an almost stationery Wedge Tornado near Turkey. Above : LP Supercell SW of Shamrock in its mature stage. Started today in Garden City with a general chase target of the Texas Panhandle from Spearman in the North to Childress and Lubbock in the South. The Models today had the dryline firing on the Texas and New Mexico Stateline but in reality they were dreadful once again with the main show being the storms that initiated on a thermal gradient over to the east of the Caprock between Pampa and Childress. After getting some lunch in Dumas we watched a dryline storm near Dalhart really struggle with moisture issues while all the time the storms to our east were looking very impressive as they headed northbound. After it became apparant the storms to the east were the main show of the day we set off eastbound and punched through some hail near Perryton to sit east of the line. The storms were pretty awful looking HP Supercells with tonnes of lightning and not much visibility. About this time both storms which were south of Interstate 40 started to drop Tornadoes and this was in response to the LLJ Cranking up and hitting those storms first as it impacted the Caprock. So we stuck with our storm as one last cell merger occured around 615pm. Suddenly with a clear base visible and an amazing looking bowl shaped wall cloud appearing and winds going insane with 35mph sustained inflow things were looking up. We headed west towards Perryton and drove under the wall cloud and suddenly came upon an amazing white cone tornado which popped out of the rain. 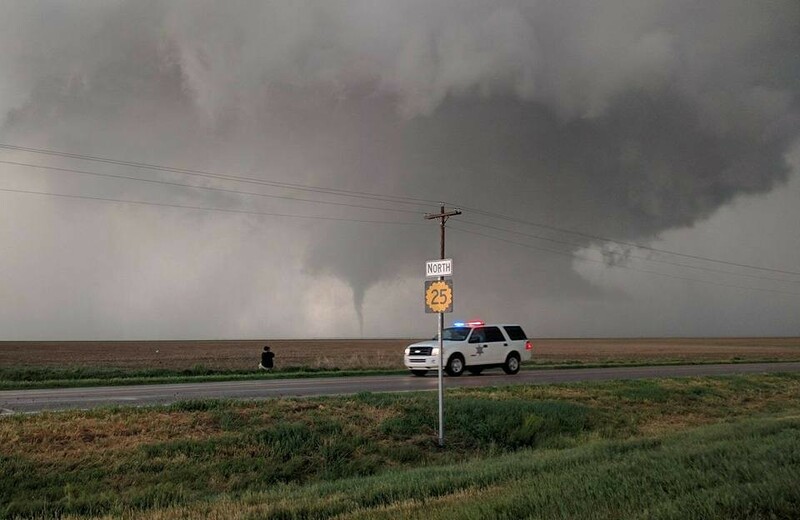 We continued west as this tornado lifted only for another tornado from a seperate mesocyclone touched down a few hundred yards to our north west. The RFD was insane around this tornado as it roped out in front of us. The bigger bowl shaped lowering was now about 5 miles to our east and on GRLevel3 was showing insane rotation so we headed back east and literally only got 3 miles east when a stout cone Tornado dropped just North of our road, this was literally across a field from us and it didnt take long for this to turn into a wedge with 73/68 spreads after all the earlier rain LCL's were on the floor. Tornado number 3 was in the bag and also a satelite tornado appeared at the same time making it number 4 for the day! Ended the day in Amarillo and celebrated an amazing day of Tornadoes in the Texas Panhandle and went on to 5 for Tour 2 with the biggest days still to come. Storms were starting to fire but were really struggling against a pretty strong cap. Around 6pm and when storms were near Leoti they suddenly exploded into life when they interacted with a NW-SE Orientated Boundary moving down from Goodland. Lightning really picked up and our now Supercell split with the right split heading off North East and the left split heading straight North and trying to latch onto the boundary. If it could then we could be in for a quick turn to tornadogenesis. Our storm then became stationery and it was then I knew it was only a matter of time as it had latched the boundary and sure enough 10 miles north of Leoti a clear slot became apparant and our now amazingly structured classic Supercell put down a slender cone Tornado just west of Highway 25. We ventured into the hook but by now the storm was becoming HP in nature so once again went 5 miles south towards Leoti where the structure was incredible. We watched as the storm fizzled away into the dusk sky watching anvil lightning and admiring the stunning Mammatus under the anvil to our south starting to get lit up by the setting sun. Not a bad start to a 7 day outbreak of severe storms for the Central and Southern Plains and another big day to come tomorrow with an Enhanced Risk in the Texas Panhandle.